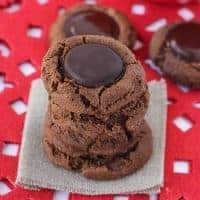 Chocolate Mint Patty Cookies! Crispy on the outside, BROWNIE-LIKE on the inside, with melted mint chocolate in every bite. Unwrap the honey mints. Place them in a bowl in the freezer for at least 30 minutes. Preheat the oven to 350F. Line a baking sheet with parchment paper and set aside. In the bowl of a food processor, or using a hand mixer, blend together all the wet ingredients until well-combined. Add all the dry ingredients and mix until thoroughly combined. Scoop out tablespoon-size mounds of dough onto the cookie sheet. Flatten each cookie slightly. Bake for 7-8 minutes. Remove the honey mints from the freezer and take the cookies out of the oven. Press 1 honey mint down onto each cookie. Bake for another 3-4 minutes. Cool the cookies on the pan for 5-10 minutes. Transfer carefully to a cooling rack and allow to cool completely. Enjoy! *If making your own peppermint patties, be sure to make them relatively thin and only 1-inch in diameter.